Waterpik vs. Floss: Which Works Better for Flossing Your Teeth? Home / Articles / Waterpik vs. Floss: Which Works Better for Flossing Your Teeth? Flossing. It’s something that we all tell our dentist we do, but most of us are probably lying. Perhaps about the frequency or even the fact that we do it at all, but most of us do not floss twice a day as recommended by the ADA. The reason for this is that it takes too long can be a pain to do properly and is just no fun. Of course, our dentists know this and have tried to find ways to make the process easier. The combination of the necessity of flossing and the hassle that comes with it led to the invention of the Waterpik water flosser. Water flossers are meant to be easier and get the results of using actual dental floss. But is it really the same? 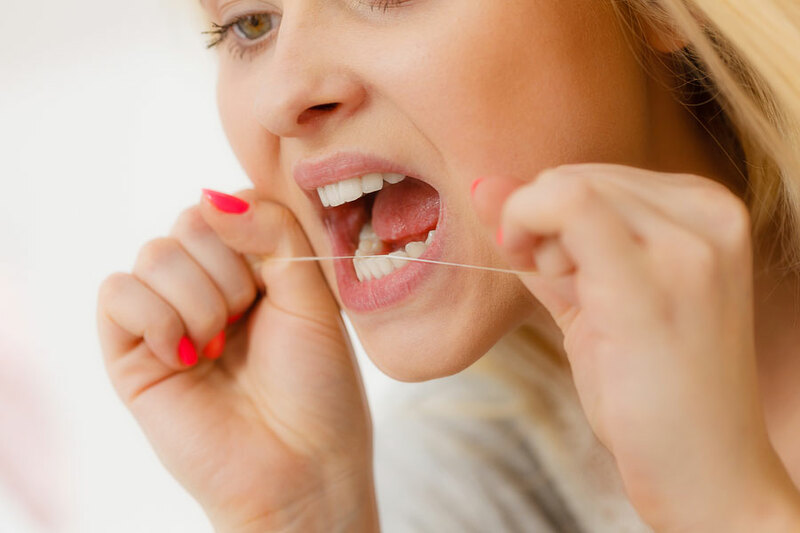 Traditional flossing involves using a thread like dental floss to scrape in between each pair of teeth all around the mouth. The goal of this action is twofold. First, flossing is meant to dislodge and remove any food or debris particles that have become stuck between the teeth. Second, and possibly more important, is that daily flossing scrapes the sides of the teeth to remove plaque build-up and prevent it from becoming hardened tartar. 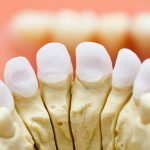 When plaque builds up and becomes tartar it can cause gum disease and damage to the tooth, including decay. Brushing your teeth does a very good job at taking care of the majority of the tooth surfaces in your mouth, but no brush can get in between teeth the way that floss can. While a Waterpik water flosser is very good at accomplishing the first goal of flossing, which is to remove debris from between the teeth, it does not actually do so well at removing plaque. The action of a Waterpik is not strong enough to simply blast away plaque. In fact, many users of Waterpiks switch to them because it is gentler than traditional flossing and they have sensitive gums or teeth. For a Waterpik to be able to reliably remove plaque between teeth, the pressure would have to be great enough that it would actually end up being dangerous for the gums. Since using a Waterpik does not remove plaque build-up the way that floss does, dentists do not usually recommend a Waterpik over traditional floss unless there are extenuating circumstances. Water flossing with Waterpiks to remove food particles and reduce the risk of gum disease may also not be ideal because they are much more expensive than floss and take up valuable counter space. Waterpiks require electricity to pump the water through so they will hog one of your outlets as well. The major benefit that a Waterpik has over traditional floss is ease of use. One must simply turn on the Waterpik and run the spray through each area between the teeth. There is no back-and-forth motion or struggling with trying to get it between teeth that are tightly pressed together. As stated previously, another major benefit to using a Waterpik is that it is much gentler than using traditional floss. Anyone who has taken a break from flossing for a while and then taken it back up again no doubt has had several days of bleeding and sore gums as the gumline gets reacclimated to being assaulted by floss on a daily basis. Even if you are trying to be gentle there is always those one or two spots where so much force is needed to get it into the crack that once it breaks free, the floss immediately jams into your gums. This problem does not occur with a Waterpik. Those who have dexterity problems may find a Waterpik to be much easier to use than traditional floss. There are apparatuses that can make flossing easier, such as this flosser product which comprises a handle and a floss head that is held taut when attached. This can be used with one hand and can easily reach to the back of the mouth with little difficulty. However, for some even this tool might be too difficult to use, such as those with arthritic hands. People with braces may also find a Waterpik to be easier to use because the braces interfere with the ability to get the floss all the way down between the teeth to the gumline. Using Waterpik with braces can help dislodge particles from around the braces and wires themselves on the outside of the teeth. A Waterpik may also be a good introductory flossing tool for children. Children often do not develop the dexterity to be able to floss for themselves until they’re older, so a Waterpik can be a starting point to learn from. This is especially helpful because children are not always going to tell you when they have something caught in between their teeth. It could be days before the debris becomes dislodged through eating or brushing. That is a lot of time for bacteria to feed on it and start causing some damage. When it comes to cleaning between your teeth there is no doubt that using traditional floss is superior to using a Waterpik. The Waterpik simply cannot replicate the scraping action that floss uses to remove plaque and prevent build-up between the teeth. However, if it is the case that traditional floss cannot or simply will not be used then the Waterpik makes a serviceable alternative. Having food stuck between your teeth is still not an ideal situation since this can allow cavities and bacteria to grow in these spaces. Traditional brushing does not clean between the teeth nearly well enough to dislodge all foreign material that may get stuck there. A Waterpik is certainly better than nothing at all in that regard. 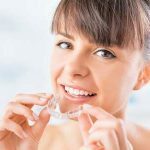 If you have trouble with traditional floss, then there are several apparatuses such as the one mentioned above which can make this job much easier and quicker. Do not give up on traditional floss if you want to achieve and maintain the best oral health possible.